Have you stumbled onto suspicious financial transactions and aren't sure what to do next? We encourage you to take advantage of the forensic accounting services offered by Perkins, Dexter, Sinopoli & Hamm, P.C. As experienced Dallas, TX forensic accountants we know how to assist with reviewing financial records that may expose questionable business practices and inconsistencies. 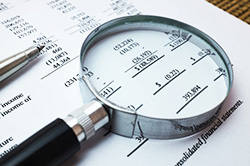 We can also review personal finances for items of income or expense which may be unreported or disputed. Whether you're a business owner suspecting fraudulent accounting practices by an employee, an individual going through a divorce, or a party to a dispute or claim we'll work with you to compile the evidence you need to support your position. When necessary, we can also provide expert testimony by presenting our findings in the matter. To learn more about our forensic accounting services call 972-669-9730 today.